Ok, so I haven't been keeping up with the latest Ubuntu 12.04 development but since I recently installed Ubuntu on my laptop, I decided I might as well post about the development releases of Ubuntu 12.04. A couple of days ago, Ubuntu 12.04 Beta 2 was released. It's there now available for download. I say I can't wait for the final release to come out on the 28 April 2012. Until then, I will stick with Ubuntu 11.10. A really popular anime that almost everyone that is a anime freak would have watched some point in their lives. Studio Ghibli successfully captures children's limitless imaginations of the world around them into a understandable film for the young and old alike. Follow the adventures of Satsuki and her four-year-old sister Mei when they move into a new home in the countryside. To their delight they discover that their new neighbor is a mysterious forest spirit called Totoro who can be seen only through the eyes of a child. Totoro introduces them to extraordinary characters, including a cat that doubles as a bus, takes them on a journey through the wonders of nature. 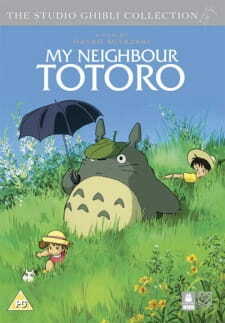 I should have done a review on Totoro a long time ago, but I never got around to it. Many of you reading this would have already watched this film. If you haven't, what are you still doing!? I would say that this is probably the oldest anime film I have watched in my life. The story is well told and it captures the imaginations. I loved how the story was told and how it makes sense even though none of it makes sense. Of course, if you are a child, you will love this anime, if you are an adult, it may bring back some memories. Let me say. This film was made is 1988. What do you expect the art to be? Well for one thing, I was really surprised at the quality of the anime for its time. The art was great and the imaginative environments clearly captivated me. You will love Totoro, the soft cushionny thing. Sound was of high quality and the sound tracks were classically brilliant. Originality was the main focus here and the film really brought that out. Nothing to complain here. You cannot compare this film to the recent animes of this century. They are a totally different level. The characters were stunning and cute. I loved the weird and wonderful monsters and mysterious beings featured throughout the film. Everyone loves Totoro but they also love the catbus more. CATBUS! I loved it! Overall, I loved this anime. It is one of those special classics that will imprint into your memory forever. The innocent portrayal of children's imaginations in a wonderful world really captivates the audience. I have rewatched this film many times and I have not got bored of it once. A lively and imaginative story just captivates the audience. Originality is here. Really well illustrated for its time. I still can't believe this film was released in 1988. High quality voice acting and brilliant musical score complements the film a lot. Loved it. Full of surprises and discoveries. Funny in many ways as well. A must watch classical anime. Really well compiled. There is something wrong with the blog posts on the website at the moment. Don't panic as I am trying to fix the situation right now. This may take a few hours to completely check and fix all the template bugs on the website. For now, please bear with the inconviences caused. Sorry!